Tolerance- the ability or willingness to tolerate the existence of opinions or behavior that one dislikes or disagrees with. Today followed the United Nations Year for Tolerance in 1995, to observe its teachings annually. It teaches that race or religion is unimportant to the potential for tolerance and friendship between them. Moreover, this day was created to encourage mindfulness and faith in human rights – in order to encourage equality and diversity across the world, the UN introduced The International Day for Tolerance in 1996. Secondly, the UN defines this virtue as respect, appreciate and acceptance of the diversity of the world’s cultures. Another definition would be all the ways that we are human. It is a human right to receive, and should be expected to be practiced by the human race as a whole. Furthermore, human rights is the core of this thought. As such, it supports the notion that humanity has the right to live in peace. 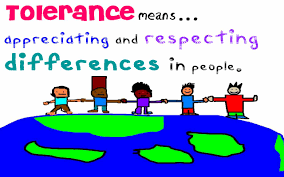 The International Day for Tolerance supports the notion that education is a key factor. An important factor in preventing intolerance across the human race. On this day, we are encouraged to educate and learn how to practice solidarity between ethnic, social and cultural groups.